I don't know about you, but I will never have a magazine-worthy laundry room. It's essentially a hallway (from the garage to another hallway) with a washer and dryer in it, and I have done NOTHING to this room since moving in. Until my dryer went out on New Years Eve. You see, you don't really notice a dryer isn't working until you need it. My dryer was loaded with wet clothes, but it just wouldn't turn on! And it just happened to be one of the few rainy days here in the Valley of the Sun, so I couldn't just hang 'em up outside (let me put your worries to rest, the dryer door latch had worn out, so it was a cheap and easy fix... we just had to wait on the part to come in). So I needed a way to line dry a load of laundry IN the laundry room, and I didn't want it to be a permanent fixture in there. I could buy a retractable clothesline on amazon, but none of the multiple line ones (to dry an entire load of laundry) were a) affordable and b) reliable (the cheap ones had bad reviews, and I hate doing laundry enough already. The last thing I need is a clothesline to wrestle with and make me hate it more). Didn't help that it had to be mailed. And the whole thing rolls up into a not-very-noticeable (in person, anyway) position when not in use. I'll give you step-by-step instructions. Note, this is a lot of words, but it's really easy. 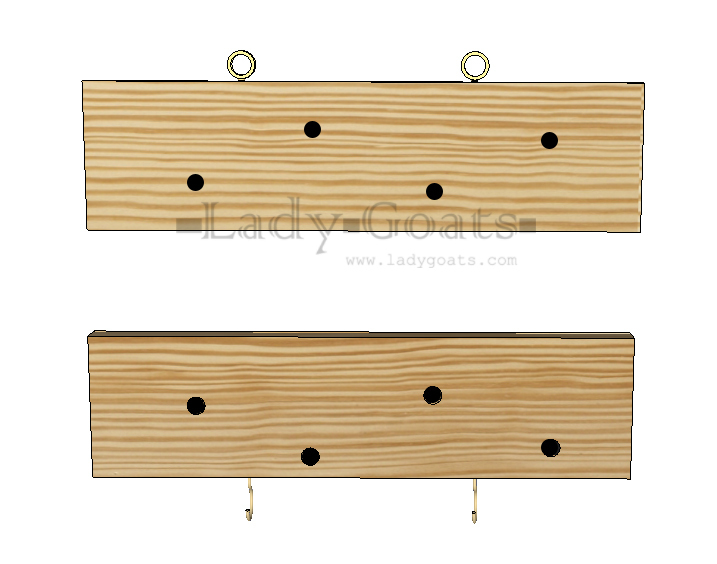 Three boards with hooks and holes. That's it! 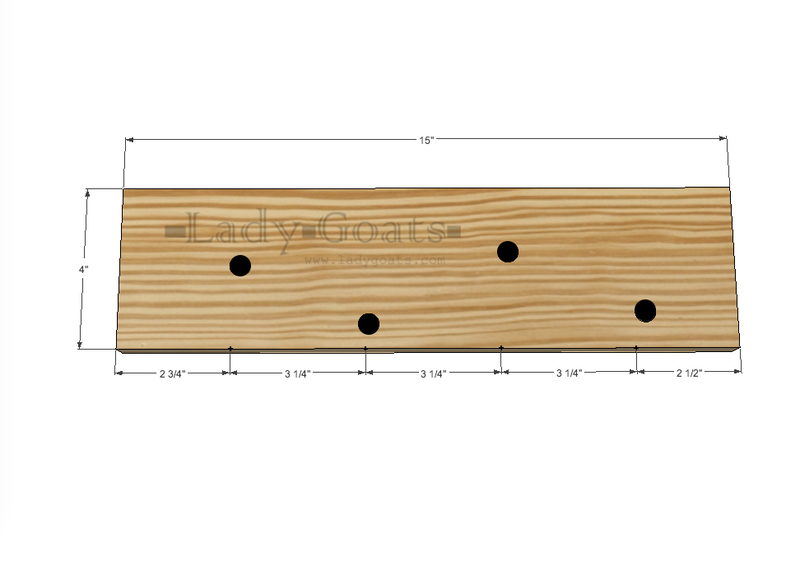 Start by drilling four holes into two of the boards. Use a drill bit that's slightly larger than the rope (but not too much, so that you can tie a knot in the back and the rope won't pull through). So that the holes mirrored each other when hung on the wall, I stacked my two boards and drilled through both at the same time. This will help to keep the lines level when everything's hung. Then, so that the rope wouldn't interfere with mounting the board to the wall, I used my Kreg Jig bit to countersink holes about halfway through the back of the board. It's not pretty, but this is what it looked like (remember, I used scrap boards!). 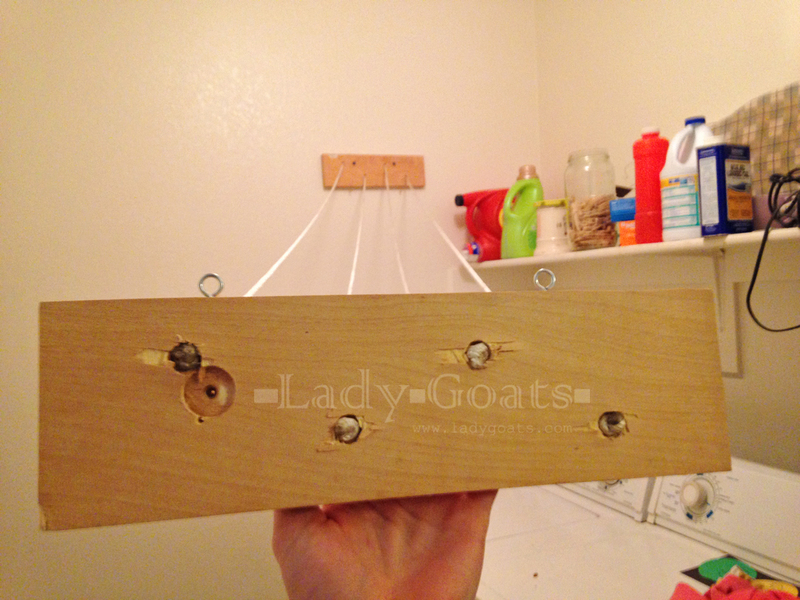 Now attach the cup hooks to the bottom of one of boards with the holes. And attach eye hooks to the top of the other. This is what they should look like (notice the holes are mirrored, so when they're attached to the wall, they'll line up. This is the view from the front, and the back should have the countersunk holes). The only thing left to do with these two is attach the rope. 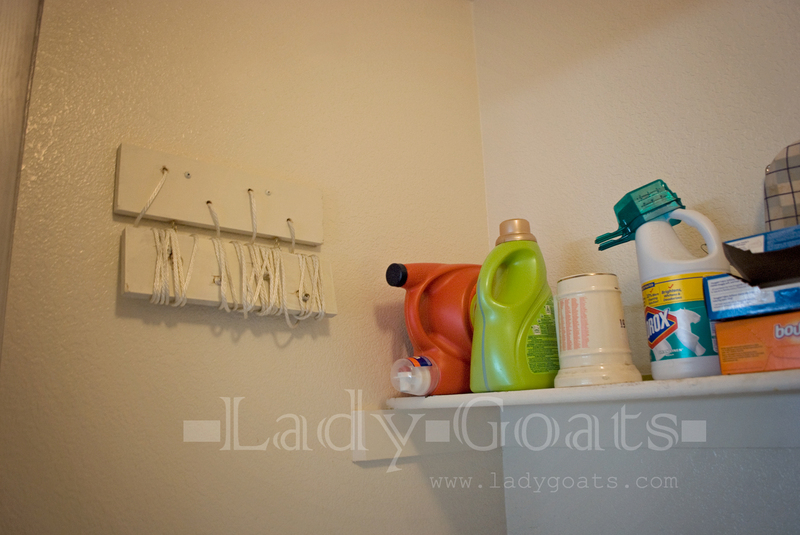 Measure the length of your laundry room and add two inches. That'll be the length of the rope you'll need (cut a little longer and you can shorten if you need to!). Pull the rope through the holes, tie in the back (burn the edges if you have a rope that frays). 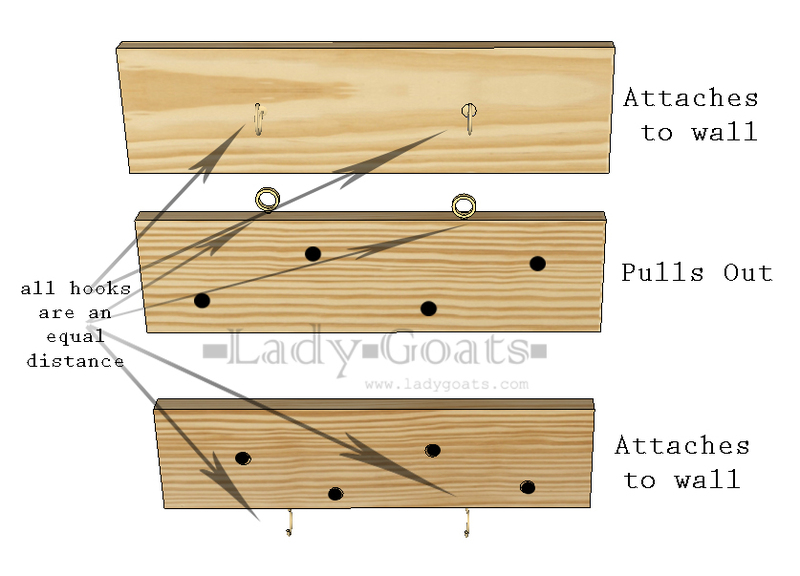 Pull taut and the rope should be nestled inside the board so the board can sit flush on the wall. The third board should have cup hooks attached to the front of it. When you're finished with that, this is what you should have. As shown above, you'll attach the top and bottom pictured boards to the wall. Keep in mind that this should be a reachable height, but high enough to keep the clothes from resting on the washer and dryer. 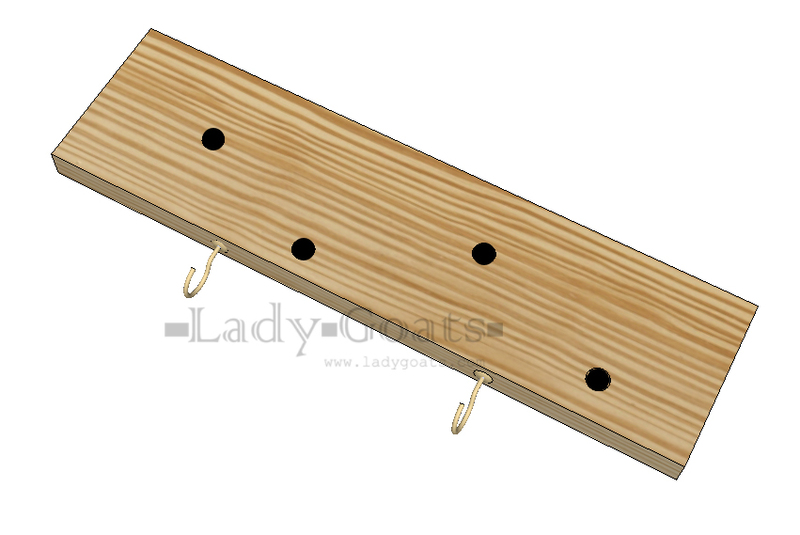 Attach the boards level from the ground and through the studs, using drywall anchors where necessary. When this is all finished, you'll make any necessary adjustments to the length of rope. If it's too long, untie the knot on the "traveling" board and retie where necessary. If you paint the boards the same color as your walls (or to match any existing cabinetry) they blend in and no one notices them! Can I admit that this has come in really handy? I used to hang clothes that couldn't be put in the dryer on hangers (or on door knobs, or the top of the laundry room door), and now there's no more looking for free space. I just pull out the clothesline and pin 'em up. Still don't love doing laundry, but this is helping to make the experience [a little] better! How's your laundry situation? 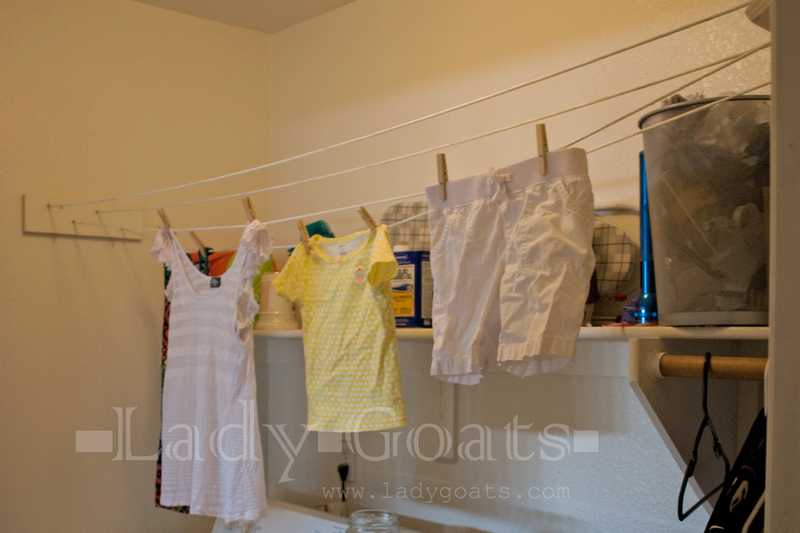 Do you have an indoor clothesline? Outdoor? Or do you just not buy clothes that can't be thrown in the dryer (wouldn't that make life SO much easier??!!!). Do tell! I live in the highlands of Guatemala, in a house with no space outside for a clothesline, and electricity is too expensive for a dryer (which are hard to find here.) I have been thinking about this idea for while, with one difference. The buildings here are all cinderblock, and I'm not sure just how to attach a system like this to the wall so that it is secure and won't ruin the wall. I love the idea of using eye bolts and hooks to connect to the wall. Now I just have to figure out just where, as the rainy season starts here in another couple of months and lasts until October or November. Thanks for the inspiration. I also don't love laundry unless it is hung in the closet or folded and put away. This will help a lot. Fabulous idea and it folds away when not needed. Thanks very much. Yes....really a smart idea...very useful for me as I shifted recently to an apartment and the only drying area is bath room...Thanks for the idea.....I will do it today itself.